We like the color-tunable bulb best, but all three are good values. At some point, LIFX surely heard the complaints one too many times: Your bulbs are great, but they’re too big, too heavy, and—well—they just look weird. Clearly bowing to consumer sentiment, LIFX has introduced a second series: LIFX Mini. As the name implies, these three bulbs are indeed a bit smaller and easier to fit into most fixtures. One of them takes home TechHive’s Editors’ Choice award. 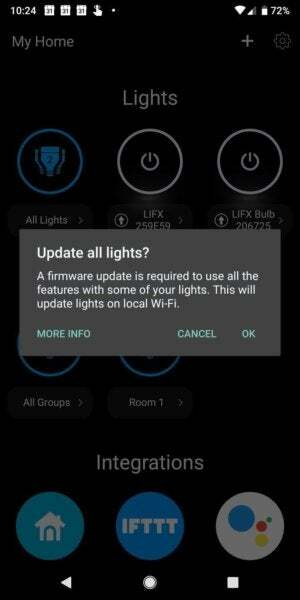 An important firmware update will significantly improve the security of LIFX smart bulbs. Ejecting the cylindrical design of its earlier smart bulbs, which remain on the market, the bulbs in the Mini line look a bit more traditional. But it’s still not perfect: The overall appearance of the bulbs is more akin to a Lite-Brite peg than an Edison bulb, but it’s a step in the right direction. These bulbs are about 0.4 inches shorter and 2.4 ounces lighter than the LIFX A19. The shrinkage, however, comes at the expense of power. These bulbs put out a rated 800 lumens, compared to the 1,100 lumens the A19 emits. On the other hand, they consume just 9 watts compared to 11. 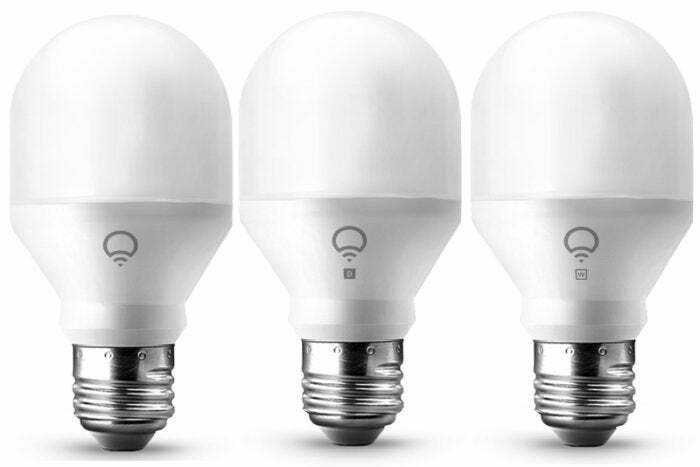 The difference in brightness is noticeable in all three bulbs in the series—the Mini Color, Mini Day & Dusk, and Mini White—but the bulbs are otherwise functionally identical to the A19. The setup process is also the same, and they connect directly to your Wi-Fi network without need of a hub. 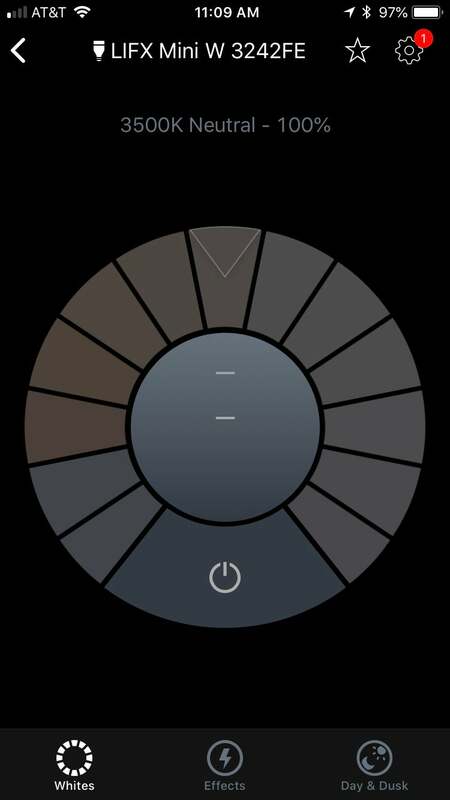 The user interface for the LIFX Mini Color, including a full color wheel, remains the same. The Mini Color delivers the same range of color production as the A19, and those colors all look fantastic. The bulb is just as speedy to switch colors, dim or brighten, or activate any number of fun party modes, including a music visualizer and a strobe light. The bulb is compatible with Alexa, Google Assistant, and Apple’s HomeKit platforms. 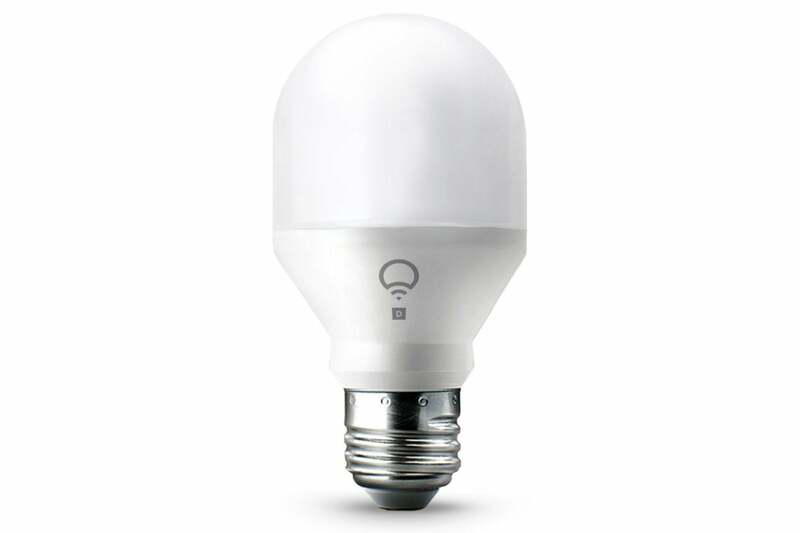 While the Mini Color isn’t as bright as the larger A19 smart bulb, it’s still in line with most of the market, and the shape of the bulb allows for more light to be delivered to the sides of the bulb rather than emitting most of it straight up—a perennial issue with the A19. The smaller bulb is also cheaper than the color A19—$40 versus $54—and it’s even less expensive than its prime competitor: the $45 Philips Hue White and Color Ambiance. Yes, you’ll find even less-expensive bulbs from lesser-known brands, but given the depth of features and quality of the light the LIFX Mini Color produces, this bulb is easily worth the additional cash. If you don’t need any color-tuning features—or really any tuning features at all—the LIFX Mini White offers a solution. It’s the same bulb as the LIFX Mini Color, producing 800 lumens max, only it’s locked at a color temperature of 2700K (though you’ll note that the LIFX app incorrectly displays the temperature as 3500K). Even at its coolest setting, the LIFX Day & Dusk bulb feels a bit warm. While the bulb is set up and managed the same way as other LIFX bulbs, it lacks many of the features of its brethren. The color wheel is not available, and the white color-temperature wheel is grayed out. Many of the special party mode effects aren’t available here, either, although you can still use the candle flicker, strobe, and music visualizer effects. The bulb can be dimmed in software, too. The app reads 3500K, but the bulb’s real color temperature is locked at 2700K. The bulb worked fine in my testing, with the exception that when I scanned the HomeKit sticker, the camera picked up a 9 instead of a 4, causing me to have to reset the bulb before it would connect to my network. The biggest selling point here is price: At $25, this is the cheapest Lifx bulb on the market by far, though it’s still a modest premium in price over other manufacturer’s non-tunable, white-only smart bulbs. While the bulb has the advantage of tying in seamlessly to the LIFX network, given that many of the LIFX app’s best features simply aren’t available on this stripped-down model, it’s probably best reserved for users who’ve already made a significant LIFX investment. “Day & Dusk” is LIFX’s shorthand for a white smart bulb with tunable light. This bulb is effectively the same as the LIFX Mini White, only instead of being locked to a color temperature of 2700K, it can shift through a modest range: 1500K to 4000K. 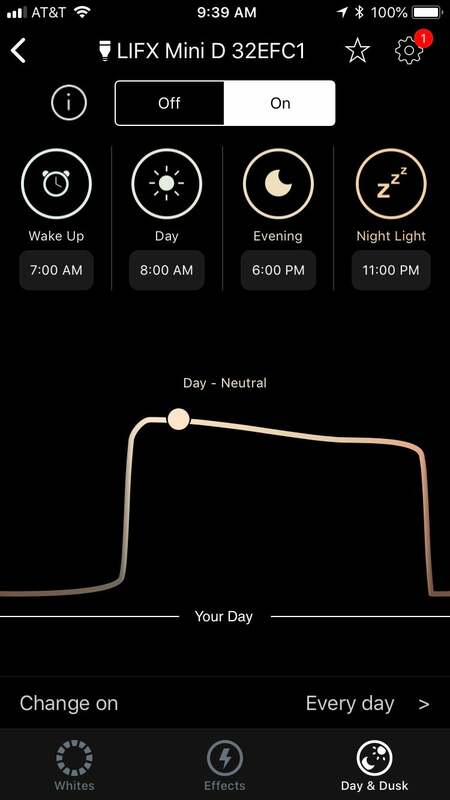 The gimmick is that the LIFX app can automatically tune the light for you over the course of a day, starting with “energizing” cool light in the morning, then fading to more soothing, warm light after hours. Overnight, the bulb can be used as a very low-brightness nightlight. All three bulbs look very similar. The LIFX Mini Day & Dusk smart bulb is shown here. As with many bulbs of this ilk—the C by GE kit, for instance—I found the default temperature settings to be imperfect: too warm in the morning, and much too cool in the evening. Also, the default brightness settings run at around 80 percent for all times of day (except the nightlight), which didn’t make much sense to me considering the 9-watt bulb puts out only 800 lumens at full strength. You can change all of these settings in the LIFX app, but, unlike the other functions of the otherwise well-crafted app, it’s not terribly intuitive. A graph gives you a visual sense of the changes you’ll see over the course of the day. The bigger issue here is that the bulb simply doesn’t have a broad enough color temperature range. 4000K is fairly middle-of-the-road when it comes to temperature; most competing bulbs stretch up to 6500K, which is considered a “true daylight” temperature. While the Day & Dusk’s ability to reach all the way down to 1500K is unique, I don’t find that anything below about 2500K—where the light takes a cartoonish, bright orange color—is all that useful. You can, of course, turn the Day & Dusk feature off altogether and use the app to manually tune the light and brightness as you see fit. Four special-effects modes are also included. At $30, the bulb is roughly in line with the competition, but the limited range of color temperatures ultimately make it something of an also-ran in this category. 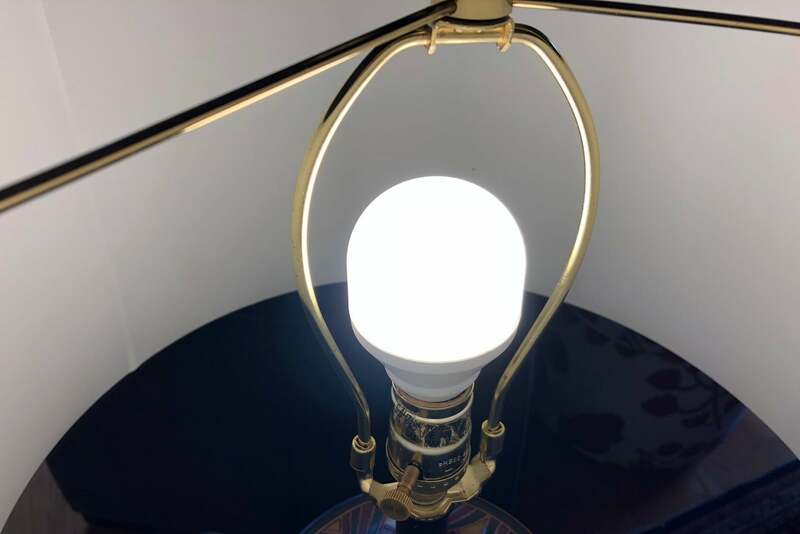 This story, "LIFX Mini smart bulb series review: Not quite as bright, but smaller and cheaper than the LIFX A19" was originally published by TechHive. This stunted, slightly dimmer version of the smart bulb standby offers nearly all the same features in a cheaper package. LIFX’s pint-size bulb arrives in a non-tunable, white-only model, but drops a ton of features along the way. 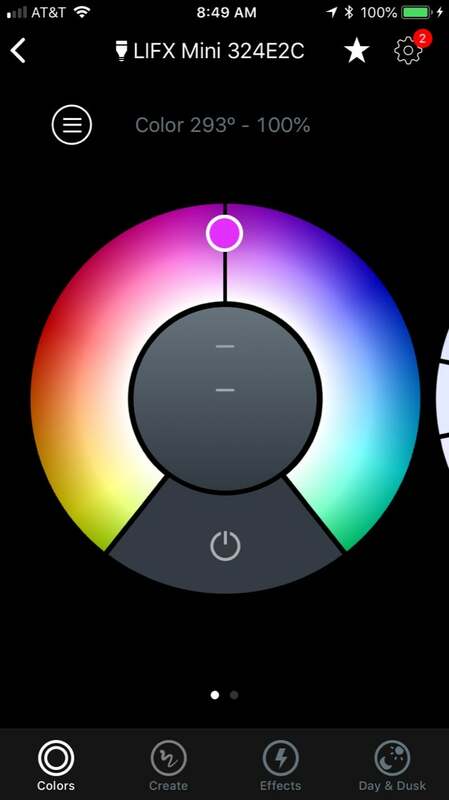 LIFX’s Day & Dusk bulb offers automatic color temperature tuning over the course of a day, but its range is too limited.